Guardian Project (an application development organization dedicated to making smartphones more secure) and WITNESS (a video advocacy group based in New York), have developed an open source application called Obscuracam. By means of a facial detection technology, Obscuracam detects faces in the photographic frame and provides an option to “obscure” them. 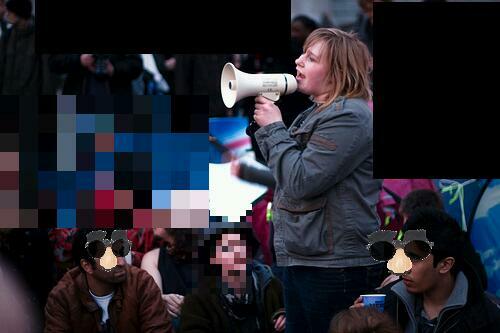 The user has the choice to redact, pixelate, or mask the faces of photographed subjects. This feature is developed to protect the anonymity of the photographed subjects, in face of police meta-surveillance of crowd sourced images online, or stored on hard drives and other devices. The software is developed in response to security crack-down on anti government protesters caught on the cameras of citizen journalists who, captured and distributed the images of public demonstrations and protests online. An article on the project on the Economist writes: “Compelling pictures from a traceable source may also prove to be a double-edged sword for protesters. Police can mine video files for hidden information (“metadata” in the jargon) that could help identify the camera’s owner, or use face-recognition software on the people being filmed.” No doubt images could be used by the police to identify protestors and activists and it could have extreme repercussions for them. A telling pre-digital example of police identifying the photographic subject is the cover of Economist in July 17th 1999. The photograph showed an Iranian student holding a bloody shirt of a fellow protestor who was beaten by the police in the first public protest in country since the massive political crack-downs of the early 1980s. The image has all the requirements of an iconic photojournalistic image: a good-looking student, with long hair and a black ribbon tied to his bicep, a bloody t-shirt, two hands holding a newspaper in front of him with an image of a woman. The picture eventually sent Ahmad Batebi, the Iranian student to prison for ten years. This example (as numerous others) underlines the human rights concerns over the distribution of images of human rights violations. As discussed in previous posts, history of photography, as opposed to painting’s, is one of a representational mediums move away from its claim to reality, what is known as photographic indexicality. The development of Obscuracam protects the identity of the photographed subjects, but it also questions the very ontology of photography while simultaneously depends on it: the photograph represents the event as it happened, even if digitally manipulated. It is within the assumption that the “obscured” image, somehow still carries with itself the buried photographic claim to reality, even if the image is a modification of what it claims to be. It invites the viewer to believe in what he is not seeing. By obscuring the faces of the photographed subject, the Obscuracam effaces the subjects in the world of images, before the security forces efface them in the world outside. The image will be of faceless victims in face of human brutality who’s last vestiges of expression are erased from the picture plane.